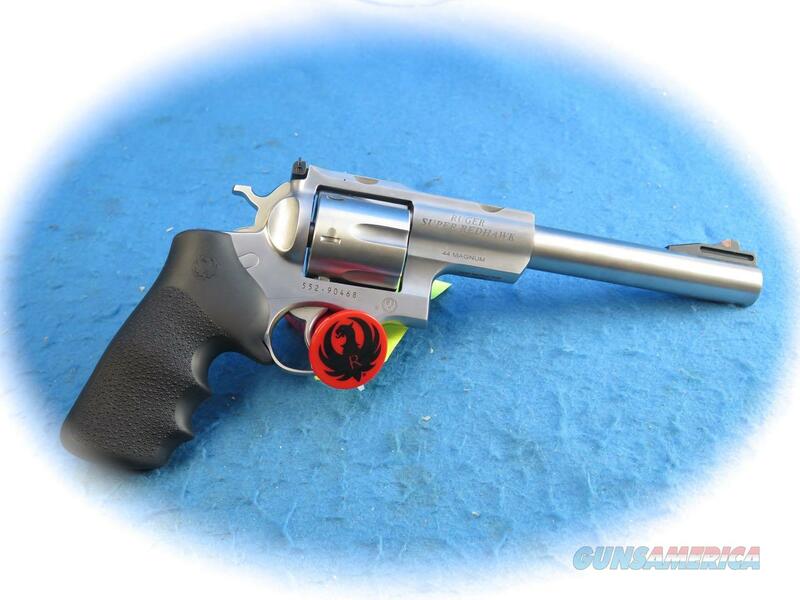 Description: Ruger Super Redhawk, .44 Magnum, stainless steel revolver, double action, 7.5 inch barrel, Model 5501. Triple-locking cylinder is locked into the frame at the front, rear and bottom for more positive alignment and dependable operation shot after shot. Corrosion-resistant stainless steel finish boasts the durability and reliability that is the hallmark of a Ruger® firearm. Strong extended frame with extra metal in top strap, sidewalls and barrel mounting areas to handle powerful, big game loads. Recoil cushioning Hogue® Tamer™ Monogrip® with an internal recoil cushion positioned under the web of the hand helps reduce the impact of powerful loads, while peg-style grip frame easily accommodates custom grips. Dual chambering allows .44 Magnum models to accept factory .44 Special cartridges and .454 Casull models to accept factory .45 Colt cartridges. Patented transfer bar mechanism provides an unparalleled measure of security against accidental discharge. Adjustable rear sight and fixed, replaceable red ramp insert front sight. Cold hammer-forged barrel results in ultra-precise rifling that provides exceptional accuracy, longevity and easy cleaning. Patented integral mounts are machined directly on the solid-steel barrel rib to provide a stable mounting surface for scope rings, eliminating a potential source of looseness and inaccuracy in the field.